Monaco and the Nurburgring may be back-to-back, but the former offers very little to go on when trying to predict what will happen at the latter. Or does it? The Monaco Grand Prix is, of course, unique - so famously so, in fact, that 'unique' is the adjective most often used to describe it. Above all, it is slow - average lap speeds are in the 90s in miles per hour, while at the Nurburgring the cars nudge 190-200mph four times per lap. What you need at Monaco is downforce; what you need at the Nurburgring is aerodynamic efficiency. They are, of course, two very different things. I may be barking up the wrong tree here - and all at Williams may demand my apologies if events prove me wrong - but I have a hunch that Williams's apparent comeback at Monaco may have been the result of some very effective scavenging for downforce. But downforce, per se, is not that hard to come by. Indeed, if an aero engineer designs a new wing that creates, let's say, 10 units of extra downforce in the wind tunnel, his technical director will usually only put it on the car if the penalty in terms of drag is less than, say, one unit. So the key - the technical director's holy grail, in effect - is aero efficiency, or downforce-to-drag ratio. Except at Monaco. There, top speeds are so comparatively low that downforce becomes the technical director's holy grail - and to hell with drag. Might it be, therefore, that Williams's aero engineers unearthed some hefty downforce in their pre-Monaco wind tunnel sessions that will be unusable anywhere else, due to the excessive drag it brought with it? After all, time was (i.e., 2001 or thereabouts) when a Williams could live with a bit of extra drag, so monumentally powerful was the BMW V10 behind the driver's head. Not any more; these days, the BMW V10 is no more than average, and reputedly well behind the latest 950-970bhp screamers from Toyota and Honda. If I'm right - and, as I say, I'd be delighted to be proved wrong, for nothing would please me more than a genuine Williams renaissance - then Mark Webber and Nick Heidfeld are unlikely to grace the podium at the Nurburgring, shoulder to shoulder, as they did at Monaco. But what of Renault? Why did their previously all-conquering rocketship, the R25, fail to trouble the scorers in a big way last weekend? The problem, we're told, was tyre wear. Yes, I reply, but why? 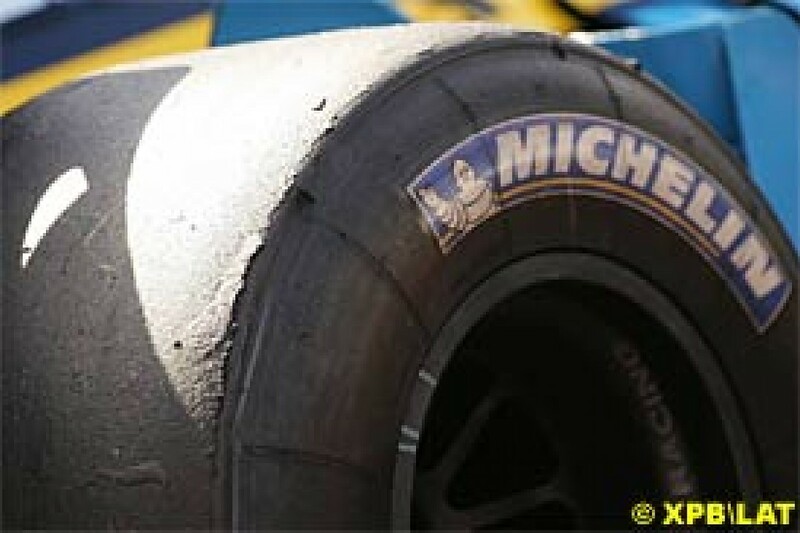 Why did the Renaults destroy even the hardest Michelin rears, when Kimi Raikkonen's McLaren barely scratched the surface of much softer rubber - and went considerably faster while not doing so? It's a weighty question - indeed, it might even be a question of weight (or, to be precise, weight distribution). All last year, the Renaults shot off the start-lines of the world - whether at Melbourne or Montreal, at Magny-Cours or Monza - like scalded cats. Envious rivals whispered mischievously about launch control replication software - but they were wrong to do so. No, as the season went on, it became clear that the R24's fabulous get-up-and-go was the result of nothing more outlandish than heavily rearward weight distribution. As a result, although it was a decent car, it was not as quick relative to its opposition on most circuits as its predecessor, the R23, or its successor, this year's very rapid R25. The R24's rearward weight distribution hurt it in fast and even medium-speed corners last year, and it is perhaps no coincidence that its single victory came at the world's slowest Grand Prix circuit - yes, Monaco. This year, the R25 is far more evenly balanced in terms of weight distribution - and faster overall as a result. Indeed, when Giancarlo Fisichella spun in one of the practice sessions in Malaysia, knocking off his R25's nosecone on a kerb in the process, the proof was there for all to see. A little Malaysian marshal almost wilted under the strain of trying to carry the errant nosecone out of harm's way - proof positive that it had been stoutly ballasted on its aero-insensitive underside in an effort to push weight forward. Did I say that the Renaults haven't started as magnificently this year as they did last year? Well, I implied it, yes, and it is true everywhere except... you guess it, yes, Monaco last weekend. There, both cars outran their neighbours as the five red lights went out on the startline gantry. Fernando Alonso closed alarmingly on Kimi Raikkonen as the cars approached Ste Devote and might have passed him on a wider piece of tarmac than that sinewy, bumpy, treacherous, diesel-slicked street, while Fisichella converted fourth on the grid to a very easy third by turn one. Had Renault's engineers perhaps decided that, uniquely at Monaco, they would revert to a more 2004-spec weight distribution, on the grounds that at Monaco the start is of paramount importance, and the ability to overtake (and, axiomatically, the ability to prevent oneself from being overtaken) correspondingly less so? Perhaps. For it is well known in F1 engineering circles that, the moment you start playing around with weight distribution, you potentially play havoc with tyre wear - especially if you have not tested your new configuration, as perhaps Renault were unable to do, for no team can genuinely do any very meaningful testing for Monaco for the simple reason that there is no other circuit like it anywhere. Perhaps Renault moved their ballast backwards for Monaco, with the result that even the hardest Michelin rears never stood a chance - particularly on the team's one-stop strategy which necessarily put even more weight rearwards than did Williams's more rubber-friendly two-stopper. If so, expect Renault to bounce right back at Nurburgring. Expect them, therefore, to be ahead of Williams once again. Podiums? Yes, probably, for both Alonso and Fisichella. Webber and Heidfeld? Oh, I don't know. Upper midfield - say, fifth and sixth, as usual? It won't make a blind bit of difference to the destination of the ultimate honours, though - or, therefore, to the identity of the young man who will stand on the central podium plinth. Kimi Raikkonen will be long gone.